The Beppu-Ōita Marathon is an annual men's marathon race that takes place every February between the cities of Beppu and Ōita on the island of Kyushu in Japan. First held in 1952 as a 35km race, the looped marathon course begins at the bottom of Takasaki Mountain and reaches Beppu's Kankoko International Port before turning back towards the finishing point in the Ōita Municipal Athletic Stadium. The race has IAAF Silver Label Road Race status. The event is sponsored by the The Mainichi Newspapers Co. and is formally known as the Beppu-Ōita Mainichi Marathon. The marathon race attracts approximately 500 entrants each year, of whom around two-thirds finish the course. The large majority of the runners are Japanese, or Japanese-based. A small number of international athletes are invited to compete each year, although other foreign athletes also appear in the race for pace setting purposes. 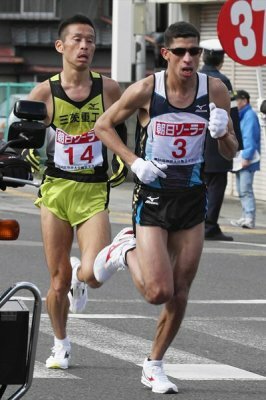 An additional road race, the Beppu-Oita Mainichi Half Marathon, was held in conjunction with the main race between 1976 and 2001.